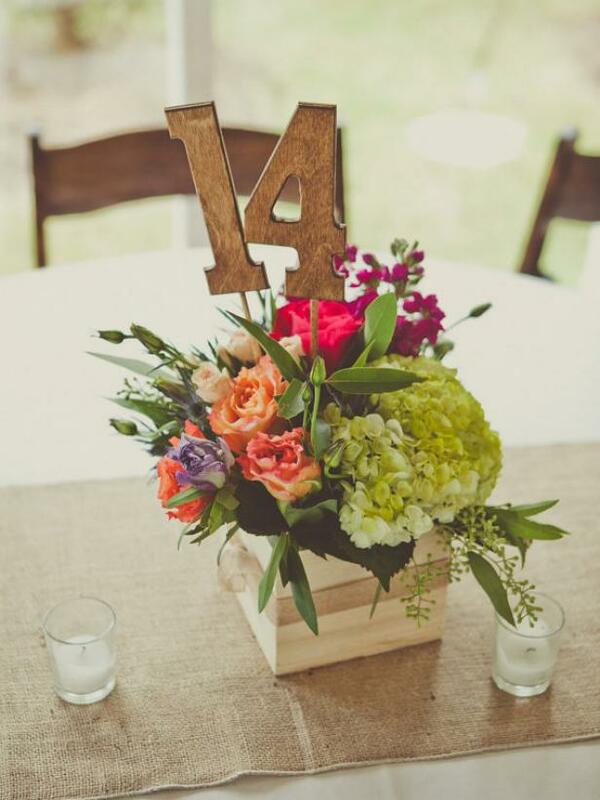 We've gathered 37 of our favorite ideas to help you craft your own gorgeous centerpieces and creative table numbers. 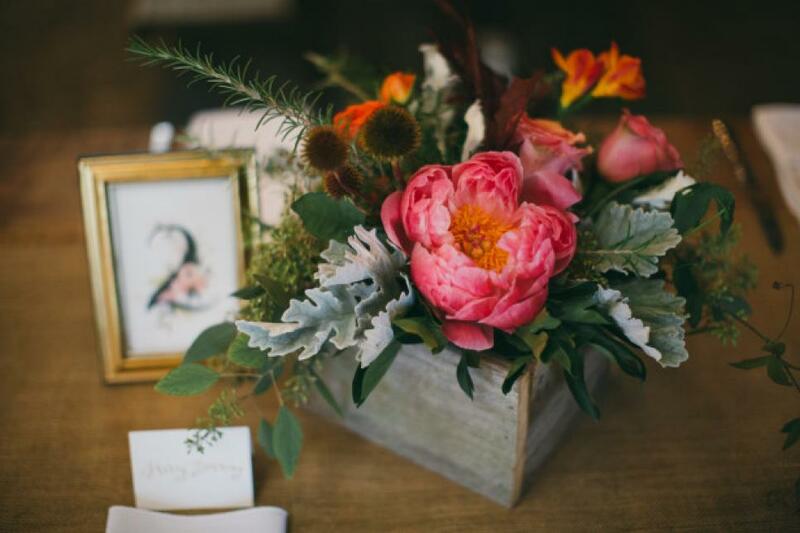 For a rustic glam wedding, a bright autumnal palette of greens, tangerines, corals and red-oranges looks brilliant when paired with wood and metallics. 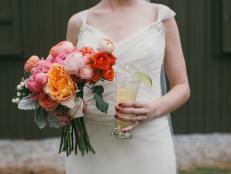 For this luxe Bohemian-themed wedding, the floral designer Lindsay Coletta wanted to avoid "matchy-matchy" design and instead blended pastels and brights. 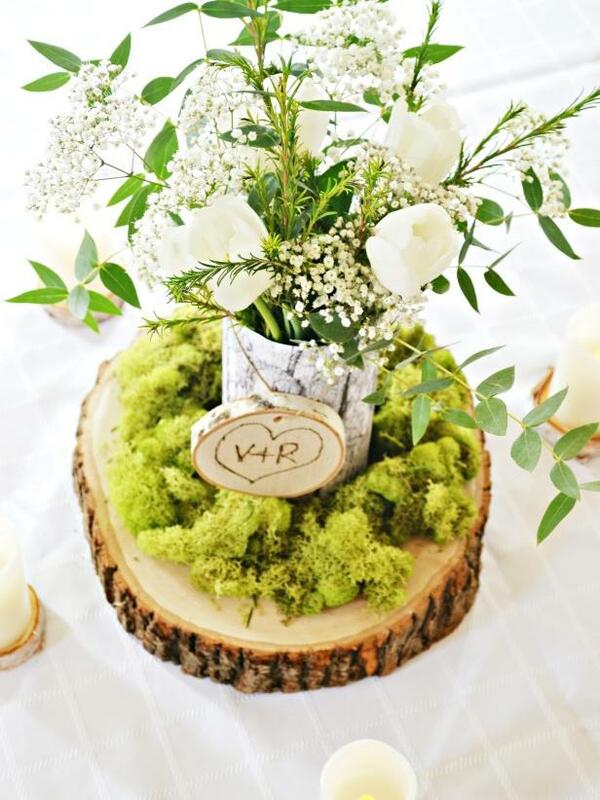 Add some rustic charm to your wedding with this simple, personalized centerpiece. 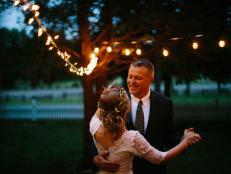 It's natural, elegant and budget-friendly. 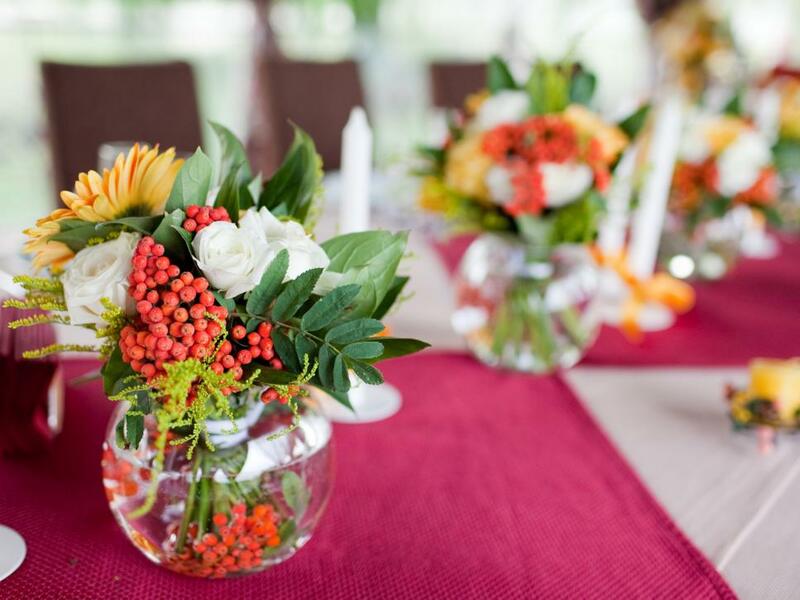 For interesting conversation pieces and to save on arrangements, consider growing your own centerpieces. 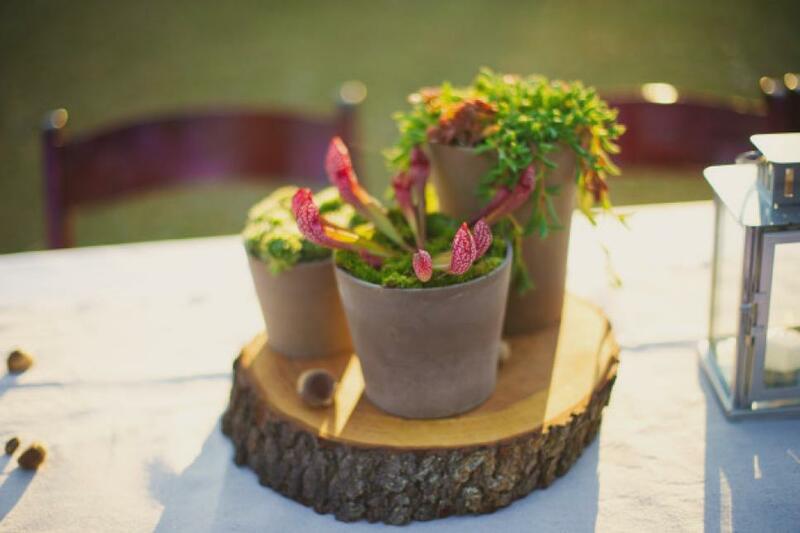 This unusual option is made up of carnivorous plants, succulents and ferns. 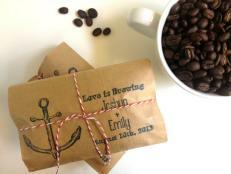 Wedding decorations are all in the details. 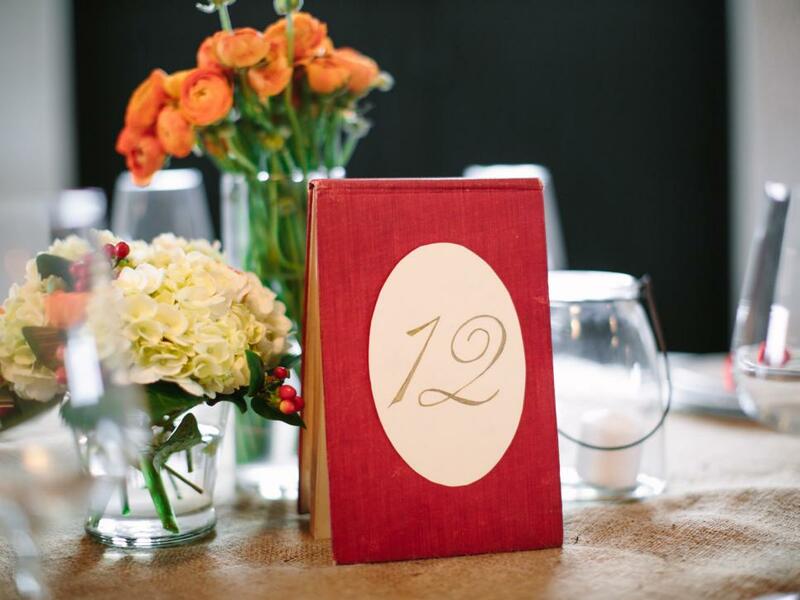 Use vintage books with a bold romantic text to create custom table numbers for a centerpiece that will inspire and impress every guest. 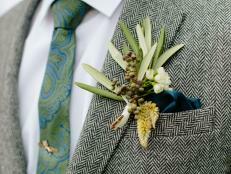 Textures and colors are key. 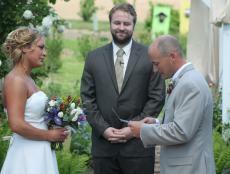 Finish it off with gold metallic ink for a little extra glimmer. 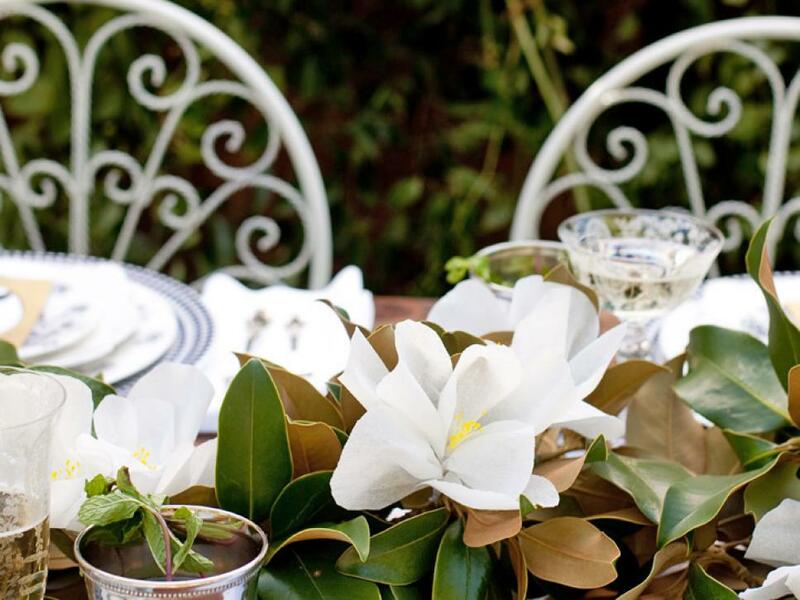 Suggest “perfect chemistry” with subtle accents in a floral tablescape. 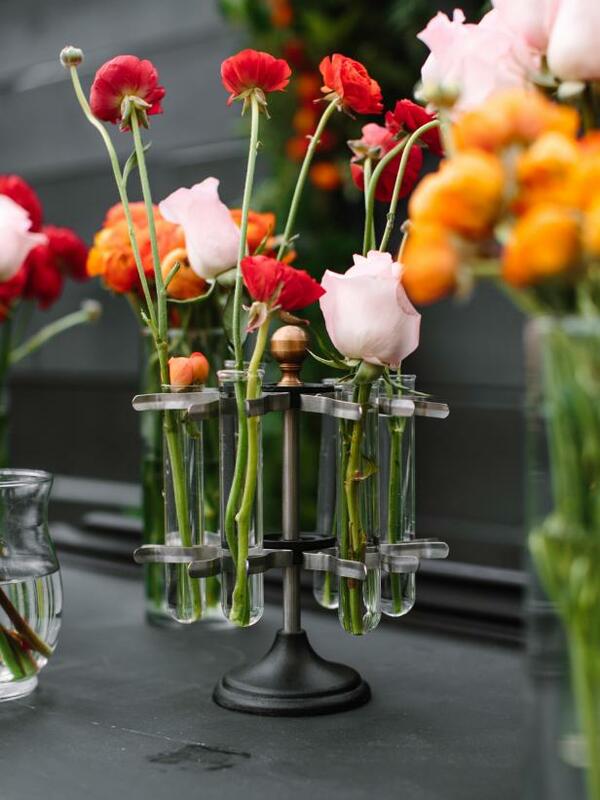 An old test tube rack is not only ideal, it is also a creative way to display wedding flowers. 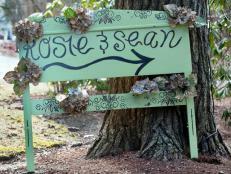 Plus, it saves on budget by making a focal point out of single flowers. 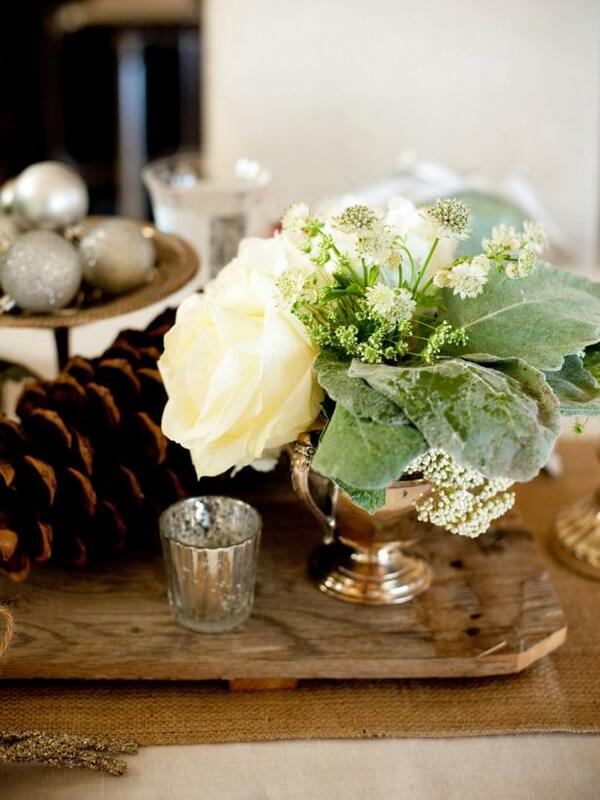 Think small and loose-style arrangements for a rustic, organic feel. 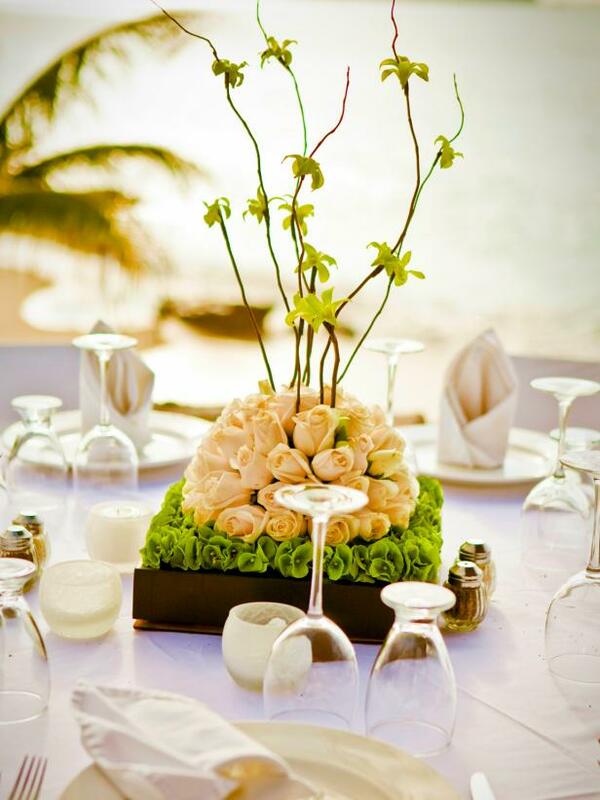 "When choosing your design, don't go for extremely tight, compacted styles that use tons of flowers. 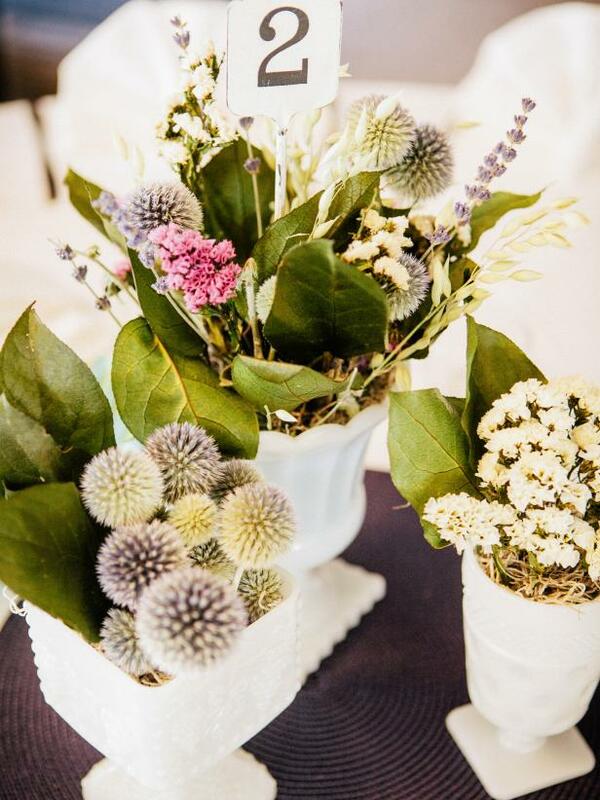 Pick lower arrangements that feature lush greeneries, like seeded eucalyptus, bear grass and plumose. 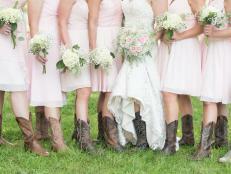 The greens will help stretch out the size of the arrangement," says Janie Medley, owner of Janie Medley Flora Design. 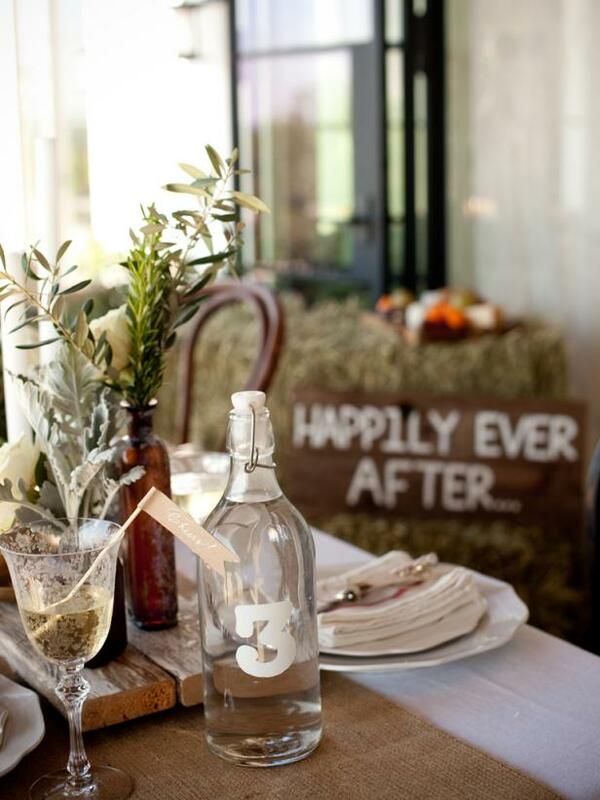 Craft easy-to-make table numbers from bottles for a subtle addition to your table's centerpiece. 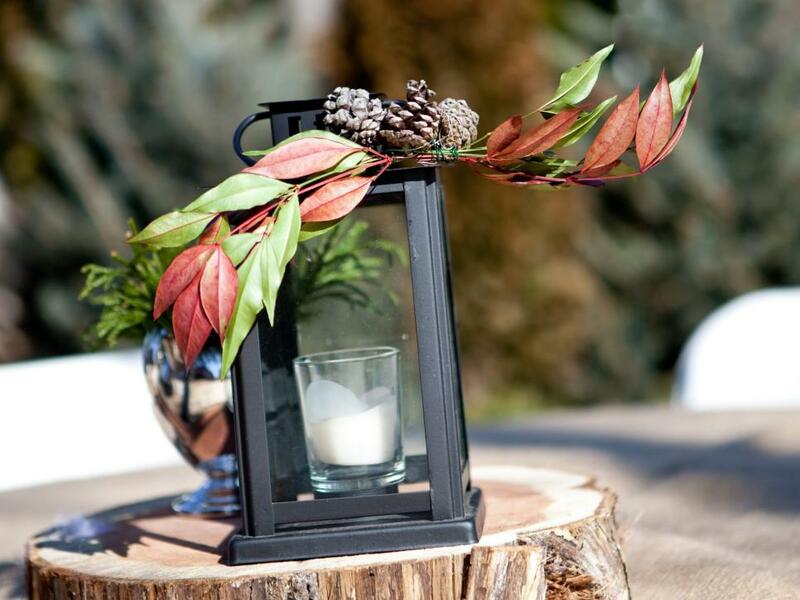 A small wooden pick placed in potted cacti creates a beautiful understated centerpiece. 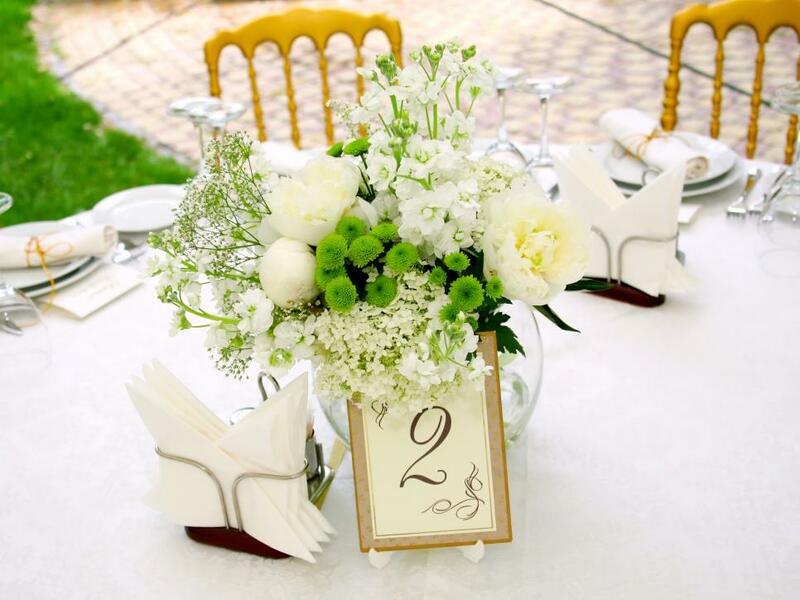 Make you own basic table numbers to lean against a classic floral centerpiece. 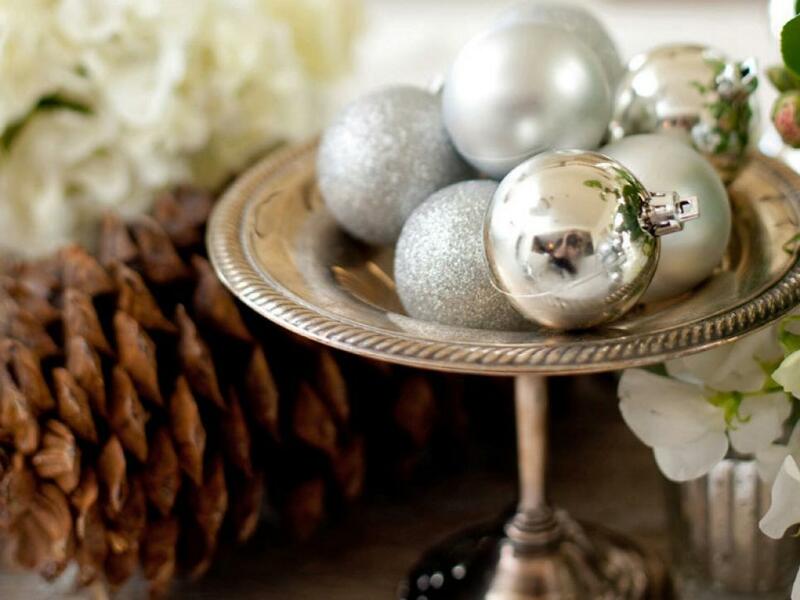 You'll save money and still create an elegant display. 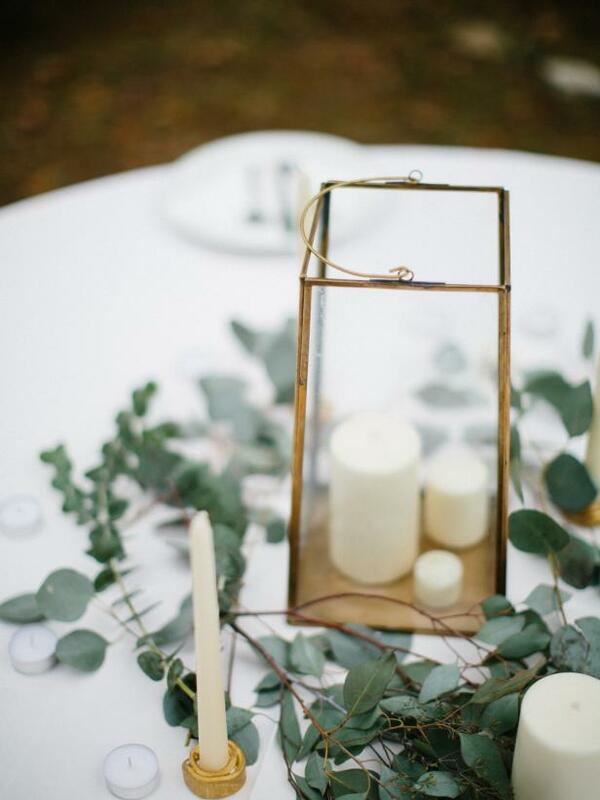 White candles, eucalyptus and gold accents exude simple Southern elegance when placed against a bright white background. 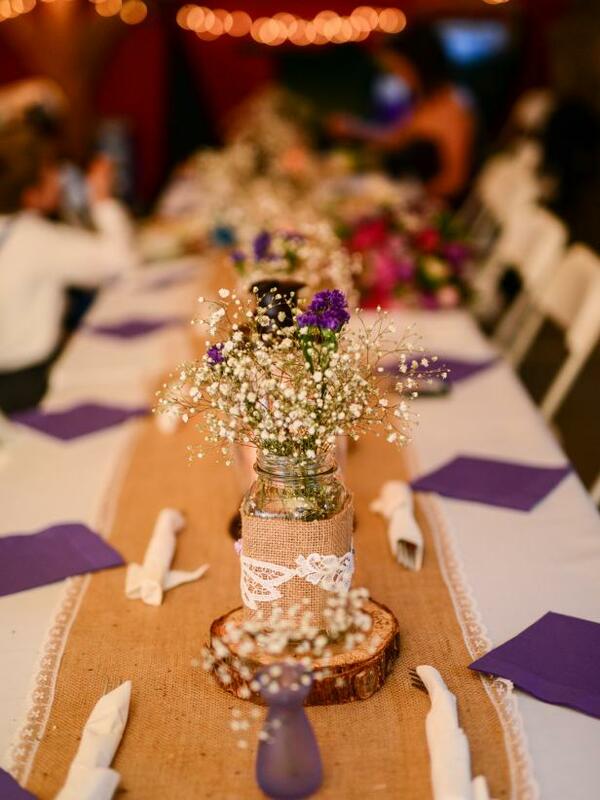 This farm wedding wouldn't be complete without a burlap table runner and simple floral arrangements filled with baby's breath. 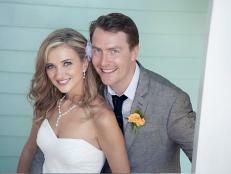 This DIY bride reused wooden risers from another wedding and added a few collected pieces to create a custom look. 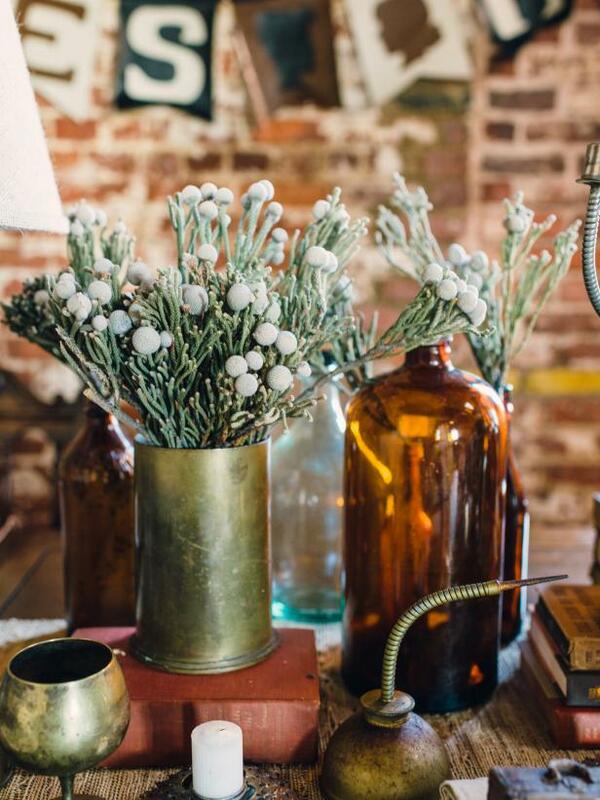 For classic country style, you can't go wrong with a grouping of glass jars filled with baby's breath and other timeless favorites. 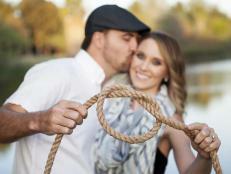 Talk about taking it to new heights and lengths. 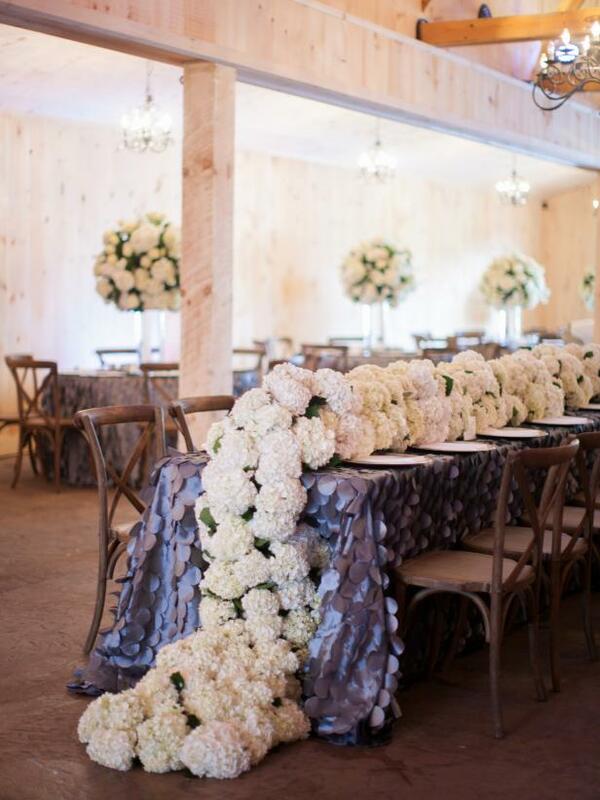 You can't help saying "wow" when looking at this exquisite runner of pretty white hydrangeas. 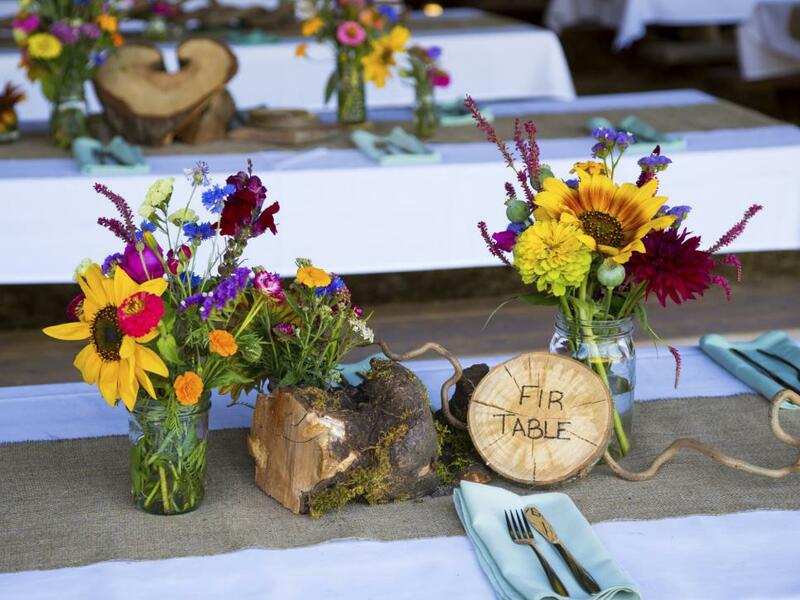 Wood cuttings and wildflowers are the perfect centerpiece option for a rustic, woodsy wedding. 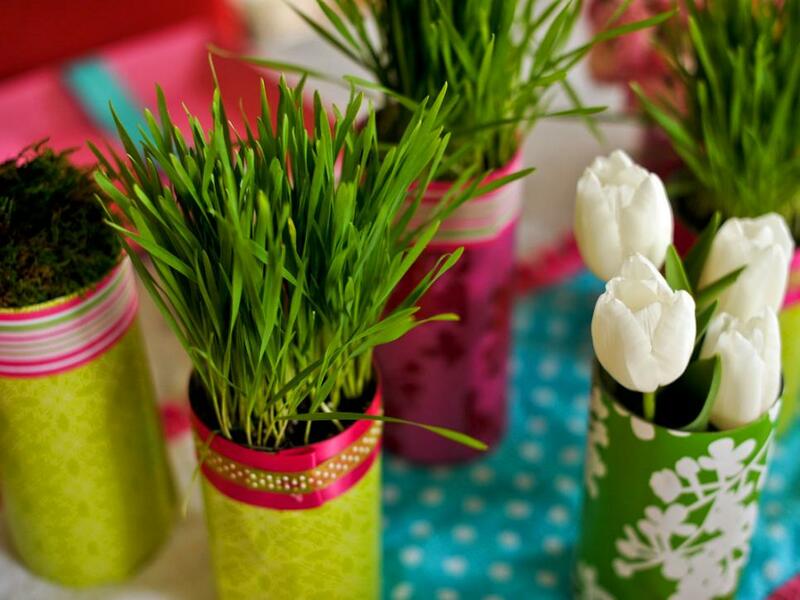 The cuttings can even double as table markers. 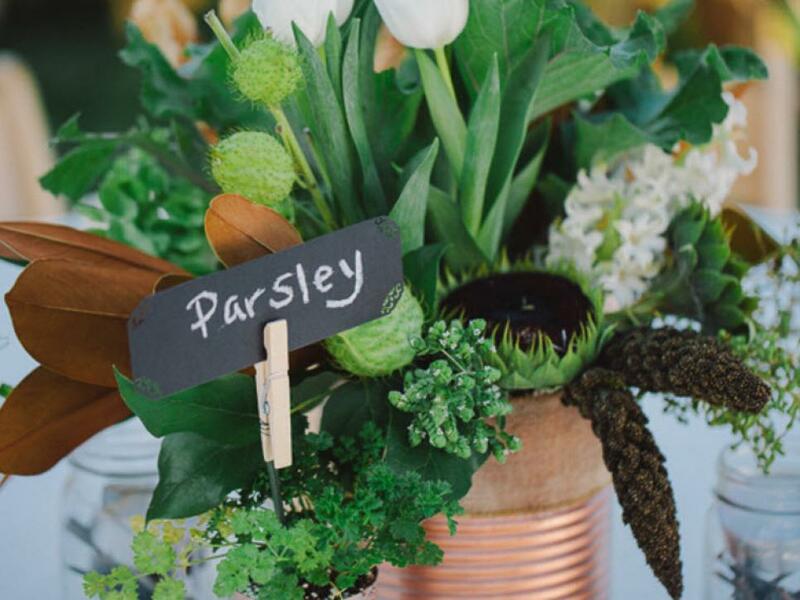 For this whimsical wedding, vintage silver pots were filled with beautiful summer hues. 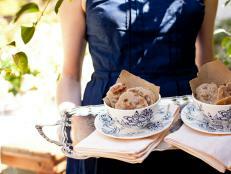 It's a tea party for grownups when you use the quaint vessels to hold your elegant arrangements. Steampunk decor is all about industrial touches with a collected-over-time vibe. 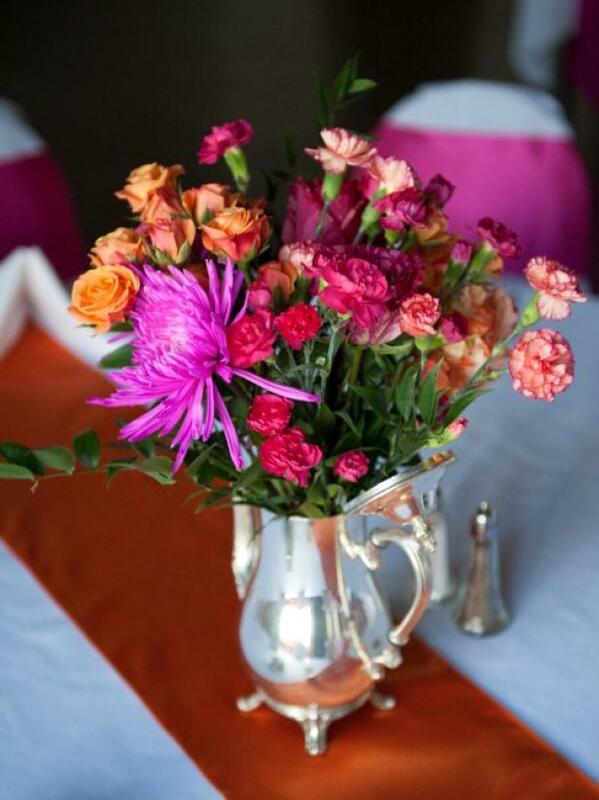 Combine vintage oil cans, mixed brass containers and various gears and gadgets for the perfect steampunk centerpiece. 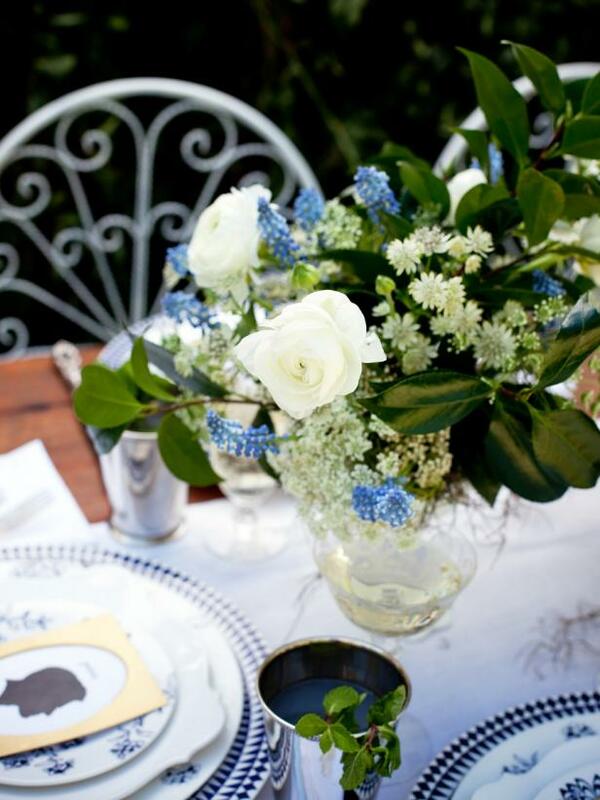 Don't forget about berries and greenery when choosing your flower arrangement. 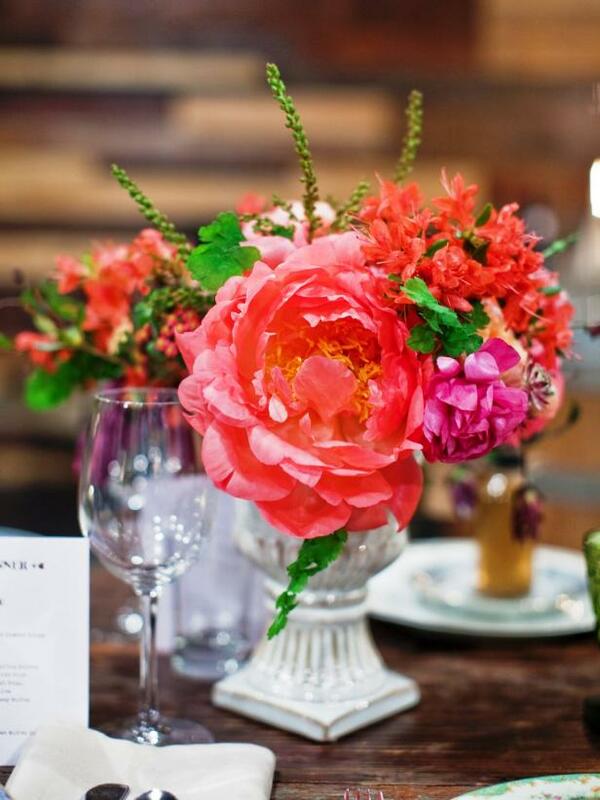 Flowers may be the star of the show, but these interesting touches add color and texture and simply look amazing. 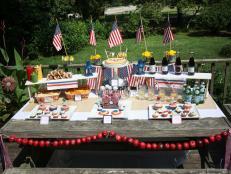 A three-tiered dessert tray is a great tool for displaying a pretty grouping of candles and greenery. 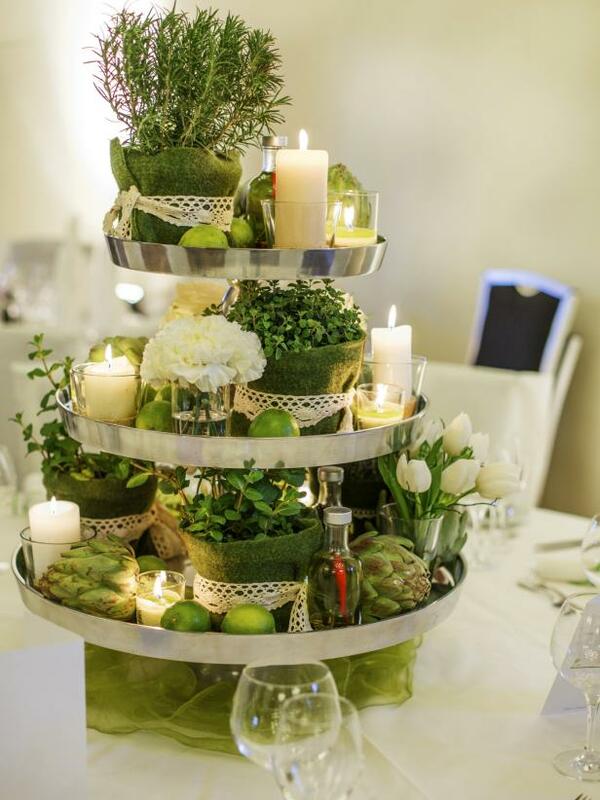 Add visual interest by using herbs and vegetables with different textures, like the artichokes displayed here. 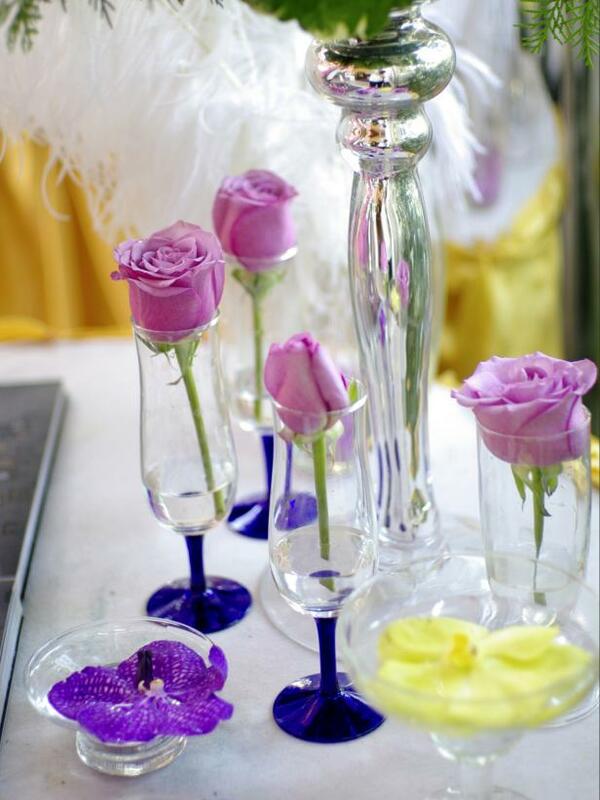 For a fairytale effect, place a single rose in a glass or vase. 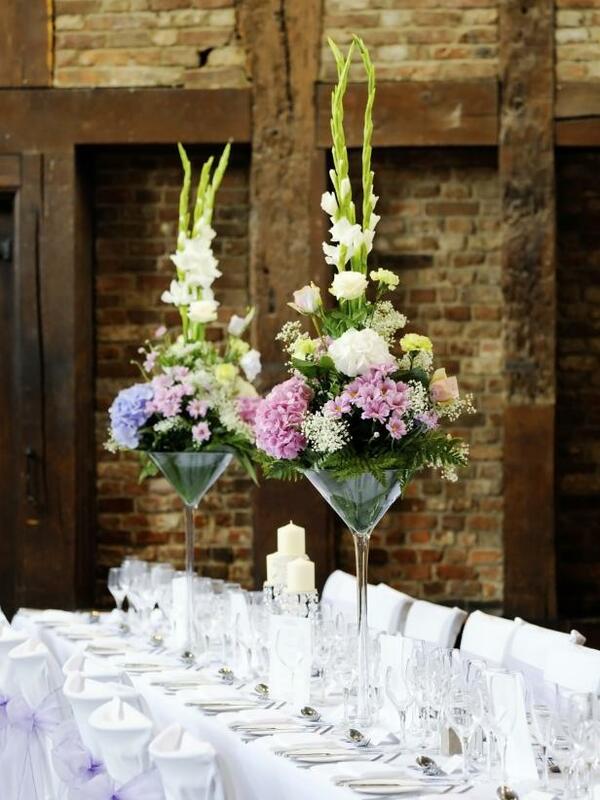 Then disperse multiple glasses around each table. 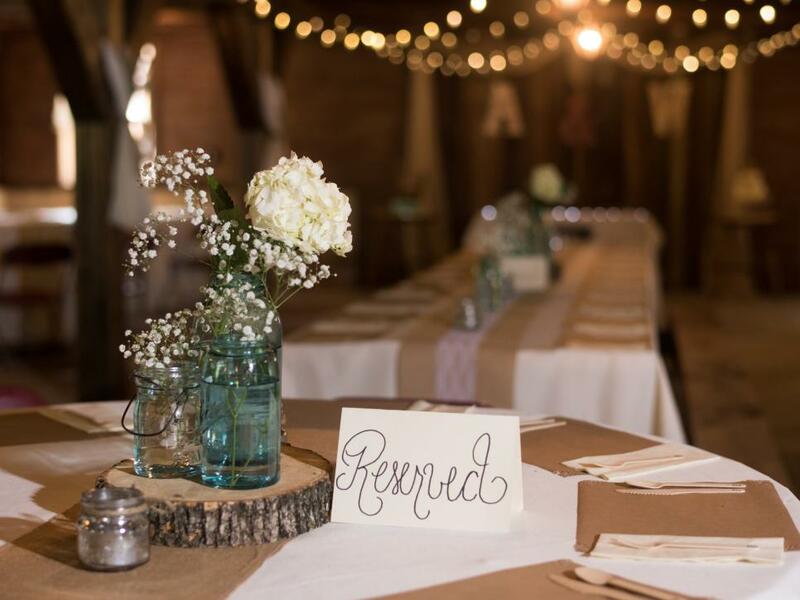 Barn wedding are still all the rage, but classy equestrian decor is an updated twist on the popular rustic theme. 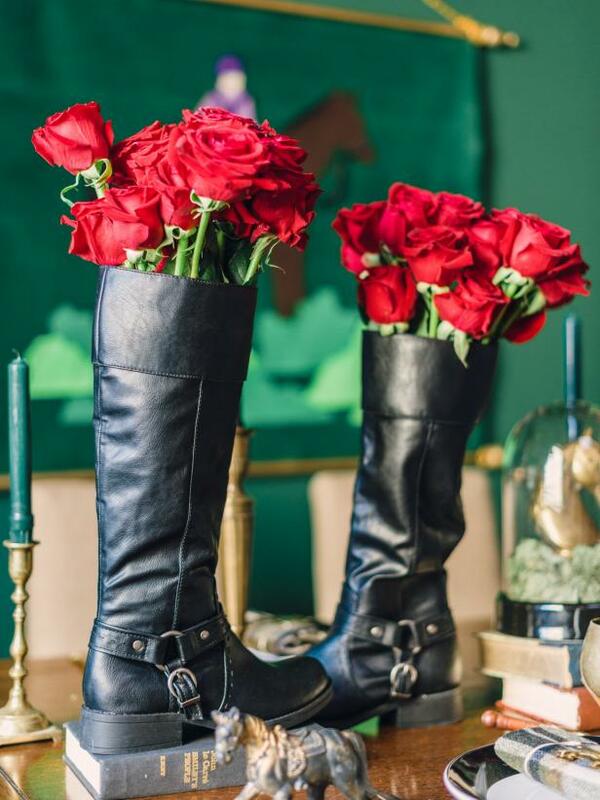 Leather riding boots look pretty and unique as vases for lovely bouquets. 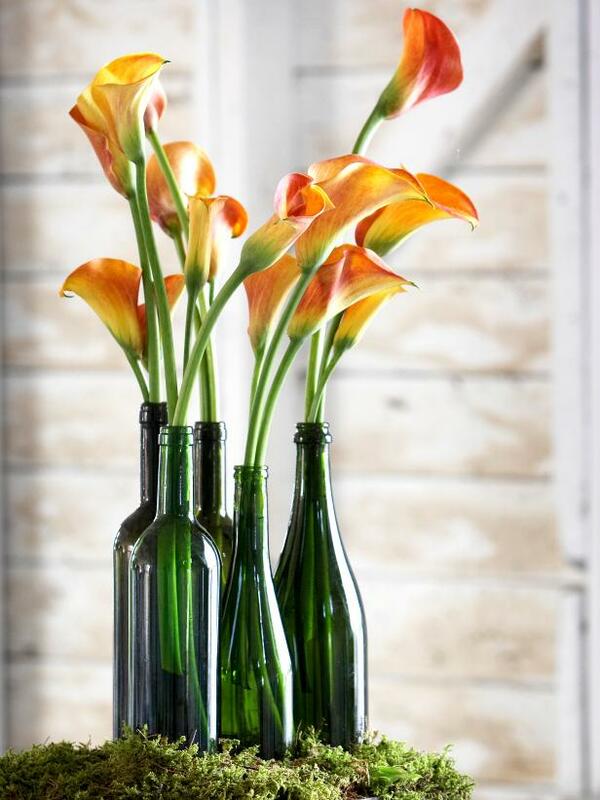 Stunning for spring, a few beautiful calla lillies in an interesting grouping of colorful bottles exudes a fun, relaxed vibe. 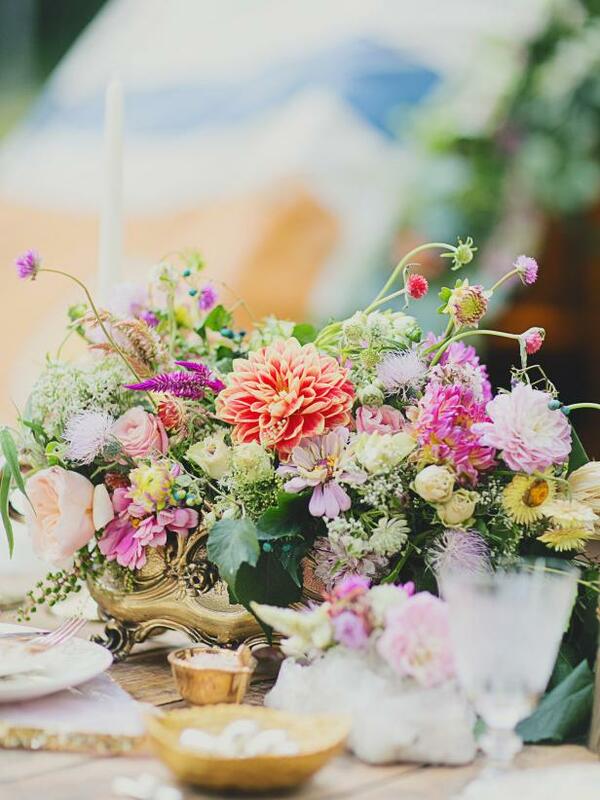 Display a beautiful low grouping of flowers with stunning branches to mix things up as well as allow guests to see each other better from all sides of the table. 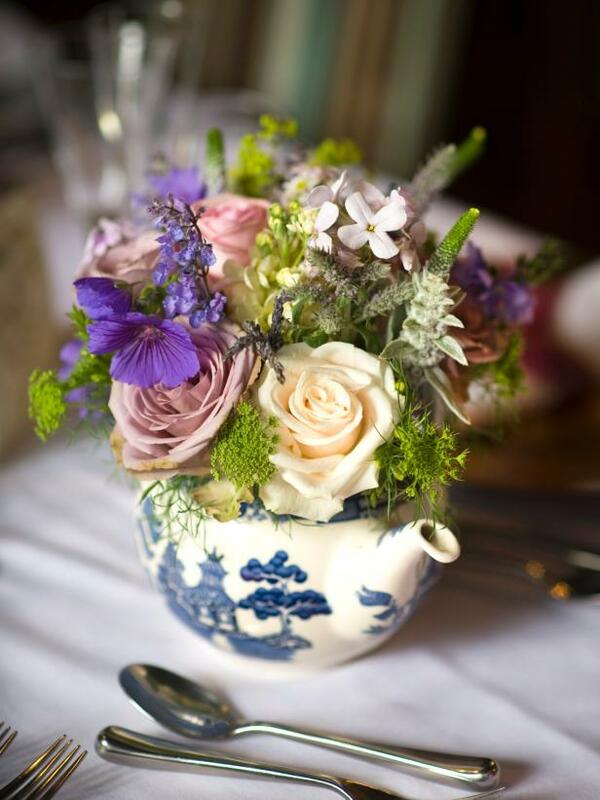 If you're planning a sophisticated Southern wedding, local flowers in vintage milk jugs will make a major statement. 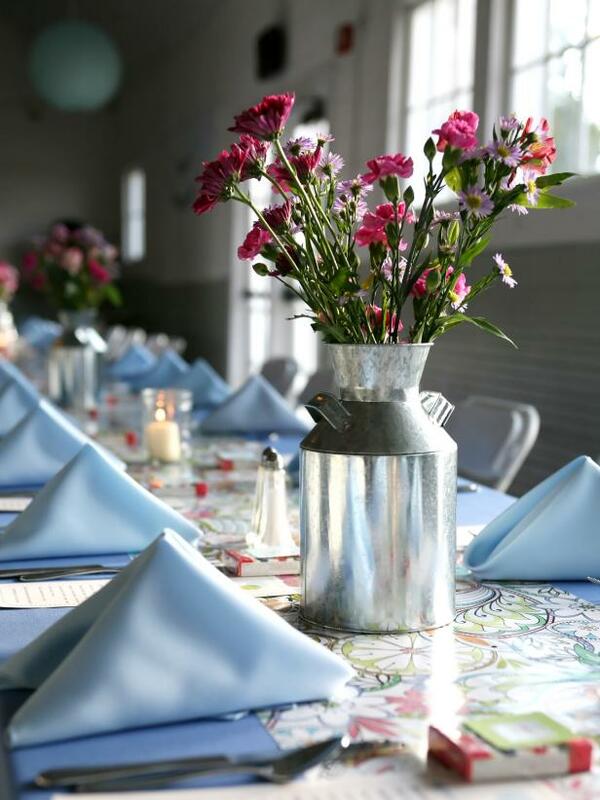 Show off your theme, and put your favorite items on display by incorporating classic cloches on every table. 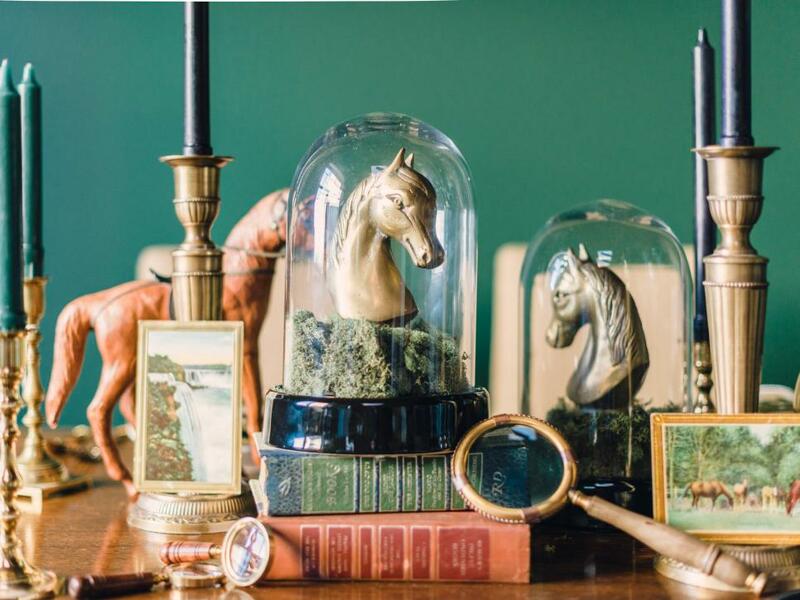 Book risers, as seen here, are a great idea for literary lovers. Can't you just smell that relaxing summer scent? 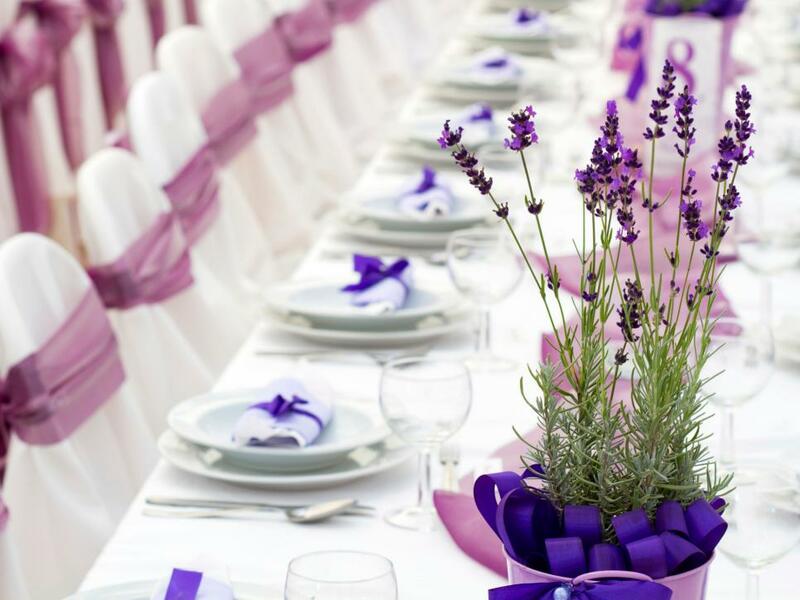 A simple pot of lavender on each table is sure to evoke happy feelings for your guests. 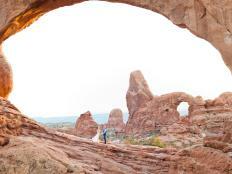 Bonus: That purple hue is amazing! 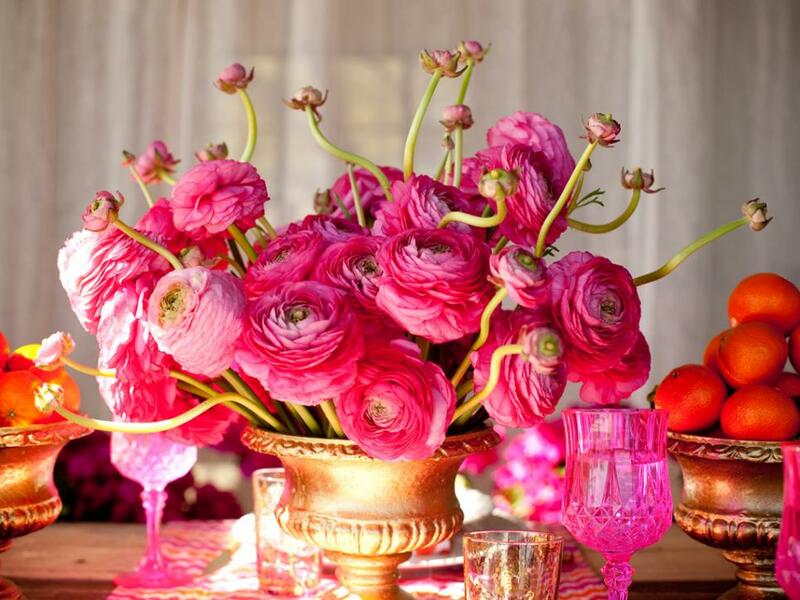 Skip the traditional vases and opt for a more fun arrangement by putting your flowers in oversized martini glasses.